The tectonic plate theory describes the large scale motion of the earth’s lithosphere. 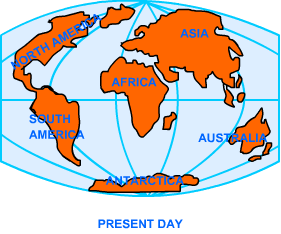 This theory is based on continental drift which explains the formation of various continents over millions of years; as we see them today. 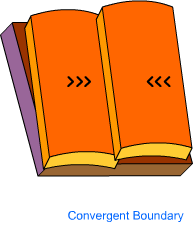 Convergent Boundary: In this case, the two adjacent tectonic plates move towards each other. 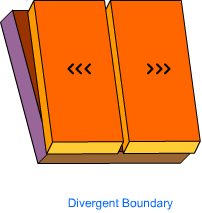 Divergent Boundary: In this case, the two adjacent plates move away from each other. 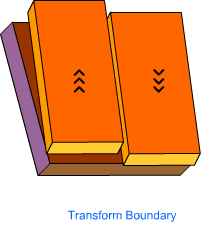 Transform Boundary: In this case, the two adjacent plates move along their borders. About 225 million years ago, the earth contained a single landmass; called Pangaea. That landmass was divided into two landmasses, viz. Laurasia and Gondwana Land; about 200 million years ago. As the figures; given here show; the landmasses further broke into different parts and experienced continental drifts at various stages. The Gonwana Land included the modern day India, Australia, South America, South America and Antarctica. 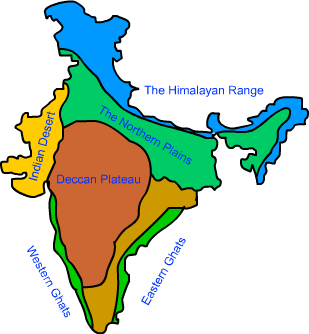 Due to the uplift of the Himalayas in the Tethys Sea, the northern flank of the Indian Peninsula got subsided and formed a large basin. That basin was filled with sediments from the rivers which came from the mountains in the north and from the peninsula in the south. Thus, an extensive flat land of alluvial soil was formed which is known as the northern plains of India.